Poulet Basquaise is not as popular in Australia as Coq au Vin or Boeuf Bourguignon. 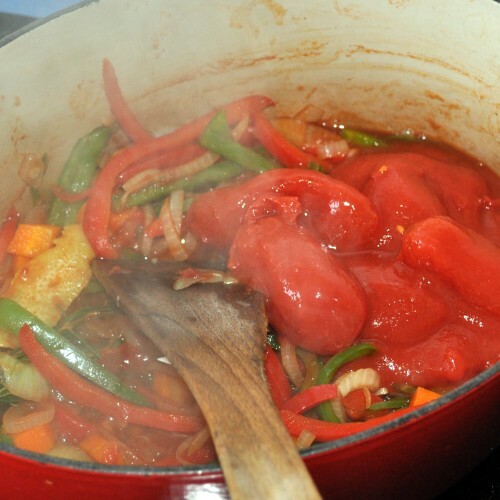 However, this summer dish packed with flavours is very popular back in the South of France. The traditional garnish is usually capsicums and tomatoes; however you may add olives and Jambon de Bayonne (we replaced it with Serrano Ham in our recipe). Preheat a fan forced oven to 150 degrees Celsius. 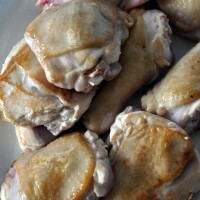 In a large frying pan, heat a tbsp of olive oil and cook the chicken pieces until lightly brown. Remember not to overcrowd the pan, cooking the chicken in two batches if necessary. Once the pieces are lightly browned, set them aside. In a large casserole dish, heat a tbsp of olive oil, add the garlic and onions. Cook until softened. 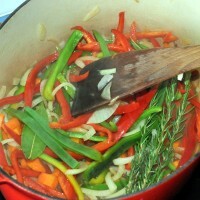 Then add the carrot, chilli and capsicums along with the rosemary and bay leaves. Add the white wine. Bring to the boil and reduce by half. Add the tomato puree and the peeled tomatoes to the casserole. Pour in the chicken stock, bring the liquid to the boil again. Turn the heat down to a gentle simmer. 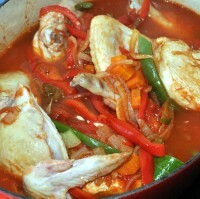 Add the chicken pieces, Serrano ham slices and olives to the casserole. Cover with the lid and place in the oven for 45 minutes. 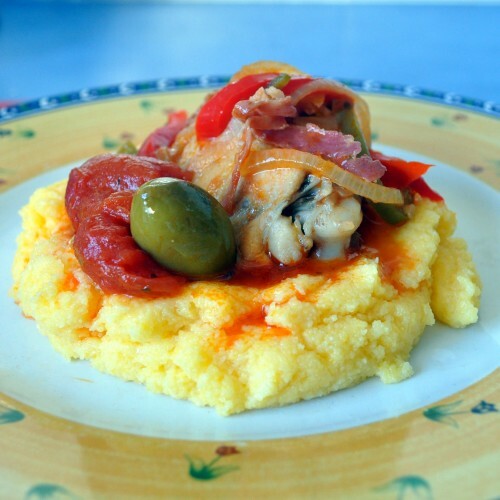 Serve the Chicken Basquaise with polenta, rice or potatoes.